If you have toured around Cartagena before and are in for a taste of local experience, this tour is really the top pick. My husband and I were met outside our ship by a tour representative who brought us to our guide. Our guide was very knowledgeable and spoke impeccable English. It was great to be around someone who lives and loves his city and told us the scoop on people, government, food and sites. We walked all over the market pace to select the ingredients for our meal later. He knew the local vendors well and as a result, we got to taste some of the fruits and vegetables right off the farmer stands before buying. 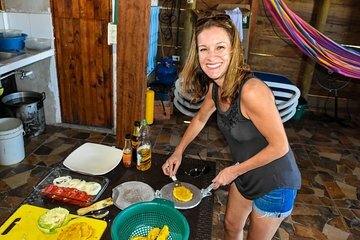 We selected local sea bass and char for the main course, a selection of vegetables for a nice salad, a whole coconut to crack open and shred for our rice, plantains, a variety of fruits including mangoes as well as local grapes to boil and chill later as our lunch beverage. The market was fascinating and stimulated each and every sense from sounds, sites, smells, touch and taste to a general pleasing feeling to be part of this amazing shopping experience! We ventured to the guide's lovely and colorful cabana on the beach after shopping and prepared our lunch meal with his wife, young adult nephew and nephew's friend Everyone worked together in blissful harmony to chop, shred and cut up all this "freshness" then season and cook together. We sat at the table with the family and enjoyed a most delectable meal, surrounded by the warmth and friendliness of this wonderful family. The food, transportation and tips for the drivers were all included in the cost of the tour. We would certainly do this again when we return to this spectacular city! This tour was one of the most amazing things I've done while traveling. Cartagena is a magnificent city but I love to see how all walks of life live when traveling. The market tour was one of the most raw and exciting things I've ever done while traveling. If you want to take pretty pictures and be a typical tourist this is not the tour for you. This tour shows how so many people live in this beautiful country and I am so thankful for this experience. The cooking lesson was wonderful as welll! We did our cooking at their beach cabana and it was a completely wonderful change of pace from the beaches in the city. Highly recommend! !